Recently, Dr. Danny L Barney was interviewed by Jenna Pittaway, journalism student at the University of Southern California, who is researching the huckleberry for a possible documentary. 1. What does it mean to be domesticated and why is the huckleberry considered undomesticated? 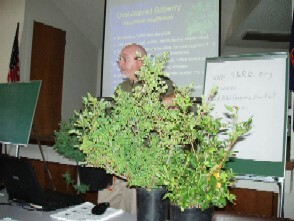 Dr Barney: Western huckleberries and bilberries include nine species in western North America that are close relatives of domestic blueberries. I use the term “western huckleberries” to distinguish them from huckleberries found in eastern North America, which are distant cousins. The terms huckleberry, bilberry, blueberry, and whortleberry are interchangeable and most crops are known by several to many different names. Western huckleberries and bilberries are undomesticated in that the plants are general harvested from the wild. The crops are generally not grown in fields or gardens and virtually all of the berries that are used personally or commercially are harvested from naturally-occurring stands, quite often on public lands. Those stands receive little, if any, management in terms of the berry crops. Aside from my program at the University of Idaho from 1994-2010, there has been little breeding done with these crops, and no named cultivars (cultivated varieties) have been released for public or commercial use. domesticating the huckleberry and where did you leave your research – could someone pick up where you left off, or is it sort of gone forever? Dr Barney: My research involved studying the biology of the plants and the habitats in which they are found, which includes the soils, climate, topography, and other plants growing in the same habitats. I collected seeds and plants from all nine species from the five Northwestern states, California, and Alaska and grew out and evaluated the plants for their potential for cultivated fruit production. After determining which species showed the greatest potential for commercial fruit production, and which sites produced the best plants and fruit, I expanded my collection trips to develop a substantial germplasm collection for breeding. The term “germplasm” refers to genetic resources, in this case live plants and seeds. From the many thousands of seedlings that I grew, I selected a handful that approached the standards I had set for characteristics such as upright, vigorous plant growth, and large fruits with good flavor, color, and acid to sugar balance. From those relatively few plants, I identified the most promising parents and made crosses by transferring pollen from one plant to another under very controlled conditions. In that way, I knew which offspring came from which parents. That program continued until the research station that I worked at and managed was closed due to budget cuts, and I left the University of Idaho to work for the U.S. Department of Agriculture. I do not know of any other huckleberry and bilberry domestication programs that are now ongoing in North America, although there is some work being done with the closely-related European blueberry or bilberry that grows across parts of Europe and Asia. I created a large amount of published information, much of it readily available on line, describing the crops, my research results, and recommendations for future breeding and research. I also taught many classes and workshops on the subject. Published research on the crops by Dr. Don Minore (retired, U.S. Forest Service) and Dr. Nellie Stark (retired, University of Montana) is also available. Seeds are easy to collect from the wild, and I donated part of my seed collection to the United States National Plant Germplasm System, where it is maintained at germplasm repositories in Oregon, Colorado, and even the seed vault in Svalbard, Norway. I expect to retire in less than two years and plan to resume my huckleberry and bilberry breeding program in Alaska. 3. Were there past efforts to domesticate the berry, or was your work the first serious attempt? Several Native American and First Peoples groups in North America relied heavily on western huckleberry and bilberry crops for food and trade. Some of the nations were expert at managing naturally-occurring stands to keep the berry fields open and productive. Fire was one of the tools that they used for managing the stands. European settlers to western North America quickly began attempts to cultivate huckleberries and bilberries, usually by digging up plants and transplanting them to gardens. Those attempts nearly all failed and the myth was born that huckleberries cannot be cultivated. In reality, the problem was that what people thought were bushes were generally little more than branches from the underground stems that make up much of the plant body for some species. Digging up plants from the wild is seldom successful because few roots are dug up with the “bushes.” For practical, as well as environmental, reasons, I stopped removing plants from the wild many years ago and grew my plants from seed. Based on what we have learned about the plants and their habitat requirements, I was able to grow thousands of huckleberry and bilberry plants quite successfully, as did colleagues in Oregon and Montana. 4. Is anyone pursuing the domestication of the huckleberry presently? Dr Barney: Not that I am aware of. More of this interview next week! 92 mySQL queries in 0.179 seconds.